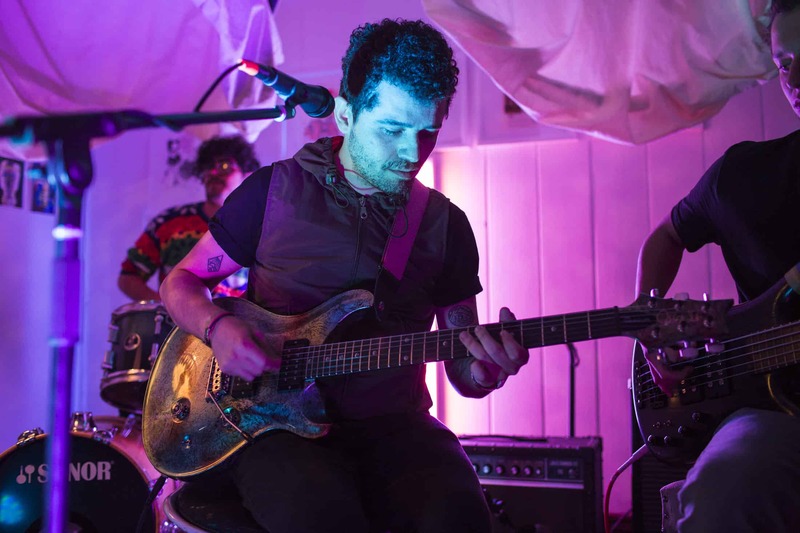 Pablo Rojas has packed a lot of versatility into his short career: the Costa Rican musician has explored genres such as psychedelic rock, pop, experimental rock and trip hop with the bands Florian Droids, Monte, and Hijos. Rojas, 34, launched his musical venture when as an organ player when he was 9 years old. With the Florian Droids band he was the electric guitarist and vocalist, with Monte he plays the bass, and with his current musical project Hijos he directs the entire creative process, from vocals to composition. He studied odontology for three years, but then transferred to publicity at the Universidad Latina. He now works as a graphic designer for a digital agency called Possible. The Tico Times sat down with Rojas at our offices in Barrio Amón and discussed his life and work. Excerpts follow. How do Florian Droids and Hijos differ musically from each other? In all aspects. The composition, recording and production processes are abysmally different. Florian Droids was a more complex band with intricate melodic and harmonic structures. Hijos’s songs are more basic. I’ve got one song that has only one chord, and it works great. If I just play it with the guitar it sounds weird, but that’s something I like to do. I enjoy it a lot because you can have three different moments and three distinct melodies in a time span of three minutes. That makes the song more dynamic and it’s more of a challenge. With Hijos I don’t record the instruments, just the vocals. I make everything with the computer. With Florian Droids it was different because it was more elaborate and refined. We’d record the keyboard and drum set that were used in the 70s and it had to be very exact. Regarding the lyrics, with Florian Droids I was more interested in abstract and surreal topics that dealt with science fiction. Hijos’s lyrics are more grounded and less farfetched. I’m interested in speaking about our daily experiences. I create the music and then hum over it. I record it and then send that to my phone. When I’m driving and get stuck in a traffic jam, I create the melody. I take advantage of the moment. I sing, get ideas, and then the music itself throws the lyrics at me. The music inspires the lyrics. I don’t think I’ve ever created the lyrics before the music. Creating the lyrics is the hardest part for me. I’m very hard on myself, so I carefully choose the words. It all flows, and the words must make sense. How do you use a computer as a musical instrument? I find it really surprising how technology has evolved. What would musicians [from the past] have done with this technology? Everything is so easy now. I record all kinds of things with my phone. I’m not a purist with the sound. Sometimes I feel that a guitar doesn’t have to be recorded with a super microphone. I remember that for the song Girasol from Florian Droids, I recorded it with my phone and when I got to the studio we liked the phone version better. I like that idea that you can create music with whatever you have within reach. I spend a lot of time behind a computer. When I’m fed up of working on design stuff, the computer gives me an immediate landscape that’s different, that enfolds me, and I can spend hours on it. Composing that way is what works best for me. I like to use samples. Kanye [West], for example, uses a lot of samples in his songs from classical music, punk and rap. The computer allows you to do that. Right now I’m working on a song called “Agua de Cielo,” which samples the song “Summertime.” I took a piece from that song and repeat it, creating a pattern, and have a completely new idea. I love the idea of translating what I’ve got on my computer to my own band. You do that by deconstructing the song and resolving it with musical instruments, or at a live concert. How did you come up with the ideas for the videos for “La Playa” and “No Te Espero“? For “La Playa,” Diego Arias did it; we’re close friends and I trust him a lot, so I told him to do whatever he wanted. I like the story because it depicts the relationship you have with your father, a relationship in which you give each other hugs and kisses as a way of love. In the video it can be mistaken for a homosexual relationship. It’s very cool because you don’t know if it’s a father-son relationship or a homosexual one. In the end, it’s a day at the beach and that’s what the song talks about. For “No te Espero,” the process was super fast. The result is beautiful and I love it. I’m very desperate when I have an idea, in the sense that I want to get it done immediately. For this video I worked with Nico Wong. He’s one of those people whom I trust completely… I’ve got a friend who’s been a drag queen for a long time now. I wanted to do a video about him performing as he usually does in real life. The protagonist of the video is watching himself; the performer and the observer are the same person. It has an existential and psychological concept behind it. Nico is very good doing his visual work, so we filmed it in one day. Which is the message behind your music? The message is that you can create very interesting things in this country. Less is more, and you must enjoy the music. Music in Spanish can work, and you can fuse it with other sounds. Costa Rican music is not always about the chonete and tawdry things. It’s got an influence of many things and you can’t categorize this music. Everything that influences us forms something different. It’s something that belongs to us, and it’s coming from Costa Rica at a specific time and space. There are a lot of valuable people here who are writing, making videos, painting and doing photography. It’s about integrating all of that to create something better. We’re bombarded by a lot of things and having access to that is very easy. It’s about taking advantage of the human resources and the talents you have in your surroundings and using them. If you do it with love, something beautiful will come out of it.